Every month, the Hubz and I seem to have the same discussion about cutting back on eating out. And yet, nothing really changes. One of the biggest realizations that we have come to is how crazy it is that we can debate for days, months, weeks over making a simple purchase for something like a new shirt or shoes, and yet when it comes to dining out we don’t even think twice. Looking back on things I am just imagining how many shirts, shoes, and new bags I could have bought over the years if we had just cut back on dining out. The trouble is, we really enjoy dining out. Not so much the actual eating part, but the social aspect of it. It’s nice to peel ourselves away from the computers and get out and do something together. It gives us the opportunity to take a break and enjoy each others company. No dishes to clean up is certainly a nice perk! So, why not dine out? What are the biggest problems with eating out? Portions – Most of the times, your portions are way too much for one person. Many times, Neil and I will share an entree and a salad or appetizer. But, whether you just aren’t feeling like eating the same thing as your partner, or you just feel like you’re hungrier than you probably are, sometimes you just want your own meal. You could always ask the wait staff to box half up of your meal before they bring it out, but, honestly, how often does that actually happen? Expense – There’s no two ways about it, eating out is expensive. Just think about how much that pasta with salad dish would have cost you at home. Would that bottle of wine you shared at dinner really have cost you $35.00 at the grocery store? Often, a meal for two (as simple as the one i just mentioned) can cost upwards of $60. In reality, you can make it at home for $15-25 (including that bottle of wine!). I know that part of what you are paying for is the experience, but why not try to recreate that at home? And hey, tipping your partner with a kiss is a lot cheaper than 15-20% of that $60 bill (and more fun!). Mystery – Often, it can be a mystery as to what you are actually eating. Unless a restaurant clearly labels each ingredient on their menu, you may not have any idea what is in your dish. Often restaurant dishes are filled with sodium and fats used to heighten flavor which makes you want more, creating repeat customers. Not to mention that you don’t know what the quality of the ingredients they use are or whether they are packaged or made from scratch. You have control – You have all of the control. You can control: the portion sizes, the quality of ingredients and the costs. When we eat at home we are able to buy high quality ingredients to make dishes that are tasty, healthy and better fit our budget. You can control the salt and the fat, which helps you take control of your diet. How can I address the things that get in the way of cooking at home? I don’t like to cook – A lot of people just don’t like to cook. Whether they find it tedious or just too hard. One way to make it fun is to find a friend who likes to cook or who is good at cooking to cook with. The Hubz used to have cooking parties with his friends all the time and found that it really helped to improve the quality of food and the healthiness of the food he was eating at home. If you are in a relationship, make it fun by making it something you and your partner do together. Break the preparation up into different steps: chopping veggies, sautéing your veggies and/or proteins or boiling the pasta for example. This allows you to spend time together and make the process a little less tedious or labor intensive. I don’t know how to cook – Look into taking a cooking class. 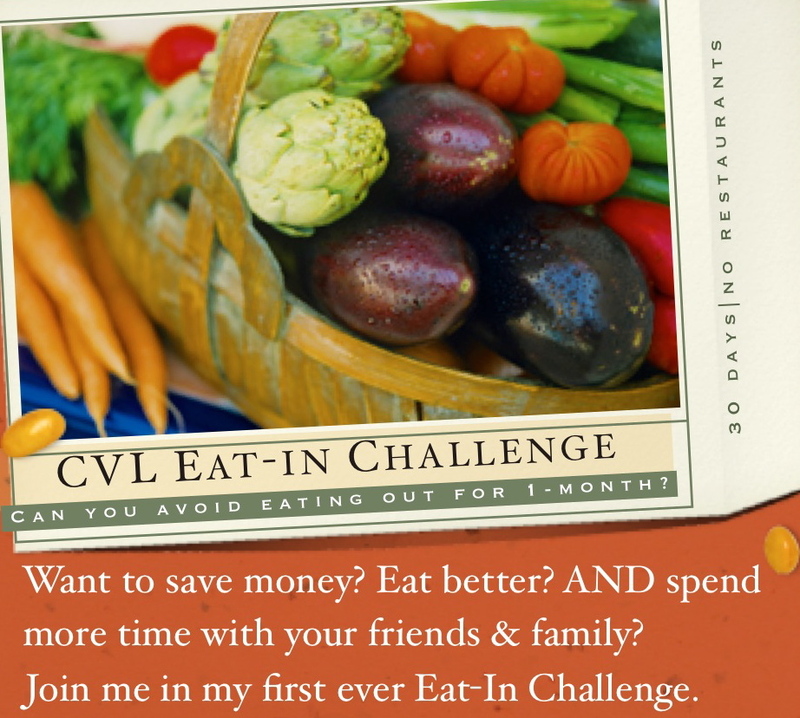 It’s a great way to learn and maybe even meet some new friends who may share your passion for food. Many local health food stores, kitchen supply stores (Williams-Sonoma for one), community centers and in some cases even bloggers or restaurants in your area are great resources for cooking classes. These classes are usually offered at reasonable rate and some classes even cater to couples. You will often find these classes focusing on different cuisines or dishes which will allow you to to become an expert at cooking the types of food you love to get when you eat out. You can often find classes offered on the basics of cooking as well (knife work, making broths, etc). Investing the time and money you would normally spend on eating out one night is a great way to learn to provide for yourself for years to come! I don’t have time – Cooking a big meal can be intimidating and time consuming. But there are lots of great, easy, tasty and healthy dishes that you can throw together quickly. Often the time you put into making a quick, healthy dish can be less than you would invest in going out to eat. Between work, health coaching and blogging spare time is hard to find, so I often feature some of my favorite quick, healthy recipes on the blog. Some examples of some quick healthy dishes include: couscous and steamed veggies and beans, salads with lots of veggies and a lean protein. A favorite of the Hubz’s is what we like to call “Beans, Greens and Grains” at home. It’s usually a combination of some sort of bean (any will do, for example: black eyed peas, chickpeas or white beans), a whole grain (brown rice, quinoa, etc.) and a hearty green (the Hubz loves kale, collards and spinach). In a pinch, when you are on the run and are really running short on time there are some great frozen healthful options from brands like Amy’s Kitchen and Kashi that are tasty, clear about what goes into them and packed full of nutrients. These meals will help you address any of the three issues I listed above as reasons for eating out and are much more cost efficient. Plan you menu for the week and make a grocery list. Make sure to include snacks and drinks on your list. Planning will help you to stay on track and to cut costs. Focus on simple, healthy meals during the week and one “WOW” dinner on the weekend. When you keep things simple you reduce stress and the desire to eat out. The “WOW” dinner is a replacement for eating out; make something special and make an event out of it. One of our favorite things to do is pick a movie and create a meal that follows the theme of the movie. Have a prep day. One of the biggest challenges many of us face is time. Take one day per week, I find Sundays work well for me, and prep your meals for the week. This helps things run smoothly through the week and you will have more time doing the things you want, rather than being in the kitchen all night. Buy in bulk and portion out. I love to buy nuts, seeds and dried fruit in bulk for snacks. When I get home I portion them out into little containers so they are easy to grab and go. This is also great to do with other snacks such as veggie sticks and hummus or whole grain crackers and salsa. Need a little added incentive to keep you on track? All participants who participate with no cheats will be eligible for a $10 amazon gift card purchased for you by me. Why you are participating in the challenge. Discuss positive changes you have experienced with your health, your relationships and your wallet.